At the beginning of 2019, Atomic Revenue claimed its first permanent office space at Thrive Coworking in Clayton. Our team previously met and worked from various co-working space across St. Louis as well as coffee shops, dining room tables, and couches. This space allows for local employees and contractors to pop in and out through their work days, while still providing the flexibility of working from home or on the go. We’re thrilled to have a headquarters as Atomic Revenue continues to scale and grow. As our team painted and outfitted the new office, it was clear our office needed a lasting name to do our beautiful new space justice. 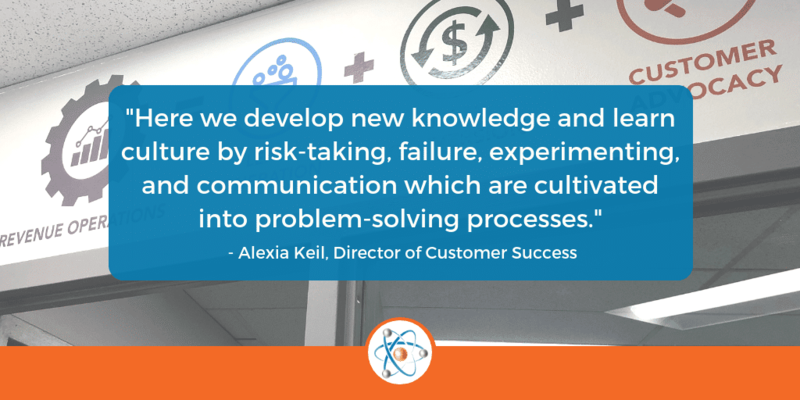 Our Director of Success, Alexia Keil, shares how our headquarters came to be named the ‘Collaboratorium’. Team collaboration is quintessential to Atomic Revenue’s culture. For this reason, our CEO’s first-grade daughter deemed “Collaboratorium” the perfect name for our new office space. While I would never question the child of the very person who signs my paycheck, I wondered if what sounded like a combination of collaborate and auditorium was recognized as a word within the English language. After some brief research, I discovered this extremely creative six-year-old was on to something big. 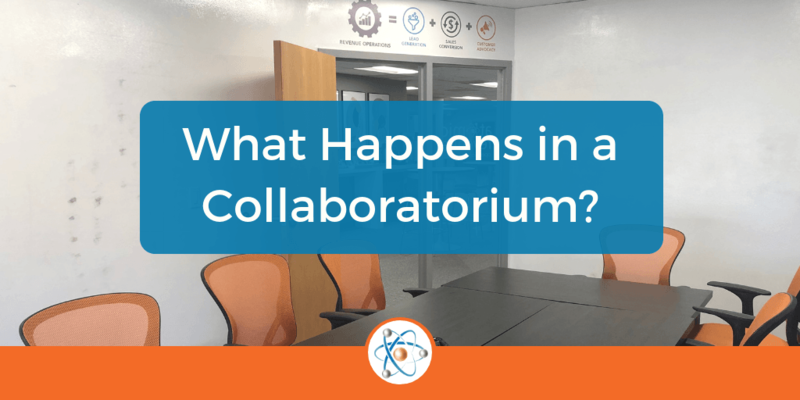 Although not recognized as a word in the Merriam-Webster Dictionary, it turns out ‘collaboratorium’ combines the English word ‘collaboration’ and the Danish word for laboratory, ‘laboratorium’. Collaboratorium is the Nordic version of the collaboratory. That brought me to the next question…. what is a collaboratory? 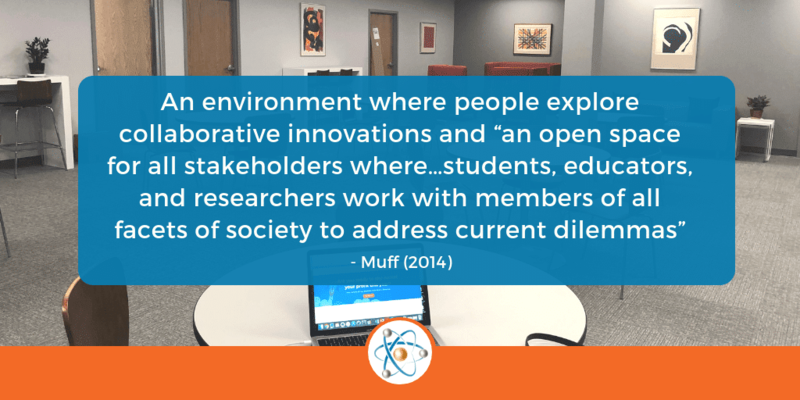 More traditional definitions of a ‘collaboratory’ describe it as an environment where people explore collaborative innovations and “an open space for all stakeholders where…students, educators, and researchers work with members of all facets of society to address current dilemmas” (Muff, 2014). This is done in a way that promotes empathy, creates mutual trust, strengthens mutual problem-solving and values and is based on an understanding of common societal purpose. This is a place where work is accomplished in a collaborative environment. Here we develop new knowledge and learn culture by risk-taking, failure, experimenting, and communication which are cultivated into problem-solving processes. The “Atomic Revenue Collaboratorium” is bustling daily to improve our client’s ROI, and it’s obvious to me now that there couldn’t be a better name for our new office. It doesn’t hurt we know some wicked smart children who open our minds to new information every day! We invite you to come visit our Collaboratorium at ThriveCo in Clayton, MO and see what this space is about. We’ll keep the coffee on.